Forwards Zach Aston-Reese, Luke Johnson, Kevin Roy, and defenseman Mike McKee were all named to the 2012 USHL/NHL Top Prospects Game today. 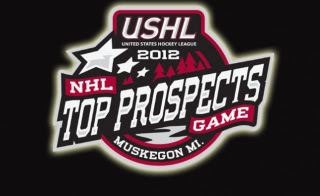 Four players who are top prospects for the 2013 NHL Entry Draft were also selected to compete in the event, including Waterloo Black Hawks leading scorer Taylor Cammarata, the top pick in the 2011 USHL Futures Draft, and Black Hawks 16-year-old defenseman Ian McCoshen who is in his second USHL season. Lincoln Stars forward Luke Johnson, the team’s third-leading scorer, was also chosen for the event. Congrats to Zach, Luke, Kevin, and Mike! Great to see our younger, up-and-coming players recognized by the USHL, and the NHL.